As a traveling judge, and a person concerned about our environment, one of the things I’m always looking at for tournaments and travel is environmental impact. While I love Magic, it saddens me that the hobby that we all love is so damaging and events are so wasteful. This first guiding article is to give judges some ideas as to what can be done to add more Green to your events and personal impact, as well as some ideas to talk to TOs about improving sustainability at tournaments. If you as a judge, TO, or player are interested in sustainability and your environmental impact, this article hopes to start ideas for pushing tournaments to be more green! Booster wrappers are made of un-reuseable, unrecyclable plastic. Many venues don’t or can’t recycle. Traveling to a GP has huge individual carbon impacts, both from players and judges, especially with longer distances. Players often leave half full food and drink containers, sometimes even spilling on the tables or ground. Food venue options are often only of fast food varieties, mostly including no vegetables or fruit options at all, and no local food choices. Paper trash, both in cards and paper is left on tables, and even if cleaned, not recycled. There are surely more concerns, so please feel free to discuss them in the comments! These can therefore be categorized to various concerns. Plastic and other trash at the venue that can’t be reused or recycled. We may not be able to change the world individually, but I hope to be able to bring some ideas in this article to finding better choices or solutions for the first few concerns. The others we’ll cover in a future article, and could take some more discussion or input from TOs and ideas from players, and will be covered later, hopefully to spark some discussion. Talk to your local area and TOs about possible ideas. So every judge has to deal with number 1 at some point or another. 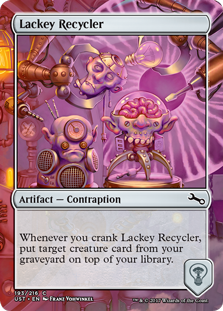 Trash accumulates wherever lots of humans are, and Magic tournaments are no exception. We as judges are encouraged to pick up trash, and clean tables. So check with your venue on what waste stream options they have. Does your local store recycle cans and bottles (some areas offer money for returned drink containers)? And what about paper and cardboard, one of the most ubiquitously recycled items? We’ll be covering the first two concerns in this article, and take ideas and offer more options for the rest later! Paper, especially scrap paper, can be easily cut to size and reused for life-total pads. Common paper products you find at events include mis-printed or taken down pairings and standings sheets, half used or unused life total notepads, or empty cardboard Magic booster boxes. Reducing your consumption of use, through reuse or simply reduction is one of the absolutely most important things people can do every day, with greatest impact. TOs can have scrap paper cut up and placed out for players to use as life total pads. Half used life total pads can have their used pages removed and given to other players. And remember to suggest that players use both sides of their paper at regular REL events. People often don’t think about the second point: Items that could be reused or have future purpose. Extra cards left behind from limited events or ‘draft chaff” are often collected at stores and GPs, to be given to local schools or youth groups, or made into beginner decks. Some people make art or crafts from cards. 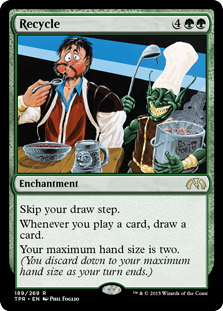 Either way, throwing away, or recycling card board magic cards isn’t the best practice, and I’m sure someone may be interested in our beautifully illustrated and fun game cards, even commons! Another consideration comes with sleeves. Extra sleeves are made of plastic, and as they wear down, they’re not useful to use in decks (for marked cards concerns, or simply not having enough for a full deck). Players will sometimes leave them on the tables. At a GP, it’s admittedly harder to find a good use for them. At local stores however, newer players often need individual sleeves for recently opened rares or foils, or want to have sleeves for their rares in their boxes or collections. Maybe they’re missing one of a commonly used sleeve due to a split or torn sleeve. My suggestion is talking to your local store about having a box to have ‘extra’ sleeves somewhere nearby, so that players can have access to extra loose sleeves, for a variety of uses. As for booster wrappers, they’re the most difficult to consider, as in most locations they won’t recycle, and won’t biodegrade. But did you know that it’s actually possible to recycle booster wrappers with a specialized box? (yes, it’s expensive, so): Look at the option of shipping booster wrappers to Hasbro for recycling! Remember too, that these are all just ideas from what we’ve seen at events, and your local area may have different ideas. 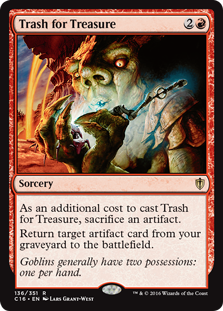 We don’t want to force things on anyone, but magic players do love value and easy access to supplies, so finding good uses for things that are normally seen as valueless is a great way to help players and staff start thinking green. These are just some ideas to help reduce a tournament’s environmental impact, and we’d love to hear more thoughts from around the world. It’s clear that most of these solutions, while good ideas, will have some impacts on greater environmental issues, but with a global program, we can make changes together! The largest thing you as a player or judge could do would be to have conversations with your TO about actions that can be taken to improve sustainability at events and reduce waste. With larger policy changes for green considerations, more events and larger numbers of players would be affected. And every small amount helps, considering the volume of events you may affect over your judging career. So what ideas can you all think of that can make Magic sustainable? We’ll offer more considerations in the next article, focusing on travel carbon foot print, food and drink wastefulness, and some fun options for judges to do while being green.